During the first half of the '90's, my partner Roger E. Hutchinson (REH) and I directed and produced dozens of instructional videos featuring some of the greatest guitar and bass players in the world. All of these shows which were produced under the Warner Bros. banner which is now Alfred. We're very proud of the accomplishments and treasure the friendships that came out of the unique experience. In many cases, the videos were shot in Seattle, Washington where Roger and I both live. We had some great times flying in the artists, picking them up at the airport, hanging out with them, eating dinner and even having a few stay at our homes. We also shot several in Los Angeles, where I commuted at the time to Musicians Institute where I taught. Many of the artists were reluctant performing in an instructional video not having a lot of teaching experience. It was my job to help them prepare and take them through the process. Besides being the director, I found myself doing all kinds of things from mixing the audio, running a camera or playing some rhythm guitar. Shoot days were often very long, but we were always able to capture more than enough information and demonstrations to put together good programs. As you can imagine, we have a lot of great stories to tell. We had lots of fun, as the shoots were filled with great playing, screw-ups, re-takes and some fabulous spontaneous performances. Some day we just have to put out an "out take/bloopers" video of some of the hilarious episodes! The video I want to tell you about is one of my favorite and proudest productions. I was lucky to have been friends with Joe Pass spending time with him at MI when he dropped by to do some clinics or a concert. He was a wonderful and down to earth person and it was easy for me to forget, when having some dinner and wine with him at a restaurant, that he was simply one of the greatest jazz guitar players who ever lived. In the early 1990's we brought Joe to Seattle to film his first REH video "Jazz Lines." When we first approached Joe about doing a video, we wanted to talk him into playing over some single static chords, II-V-I and turnaround progressions. Knowing Joe, we expected him to swear at us in Italian, refuse, and tell us that students should only learn tunes, not scales or licks. But to our surprise, Joe thought it was a great idea. "Jazz Lines" turned out to be an absolute goldmine of classic "Joe" as he played brilliantly over simple static chords through altered turnarounds. This still continues to be one of my most recommended jazz guitar videos. A few years later Joe agreed to shoot a 2nd video that would be more of a "live" concert and clinic called "An Evening with Joe Pass." The plan was to shoot the show at Musicians Institute in LA in front of a packed house. I thought it would also be cool to film Joe's entire visit to the school so our camera man and I met Joe in the parking lot when he arrived and just kept rolling as he came in the building and got ready to play. He didn't even bring an amp and told me to just take the guitar direct into the PA. We actually got a pretty good recorded sound on his guitar which sounded amazing live in the audience. "An Evening with Joe Pass" is a very special 90 minute instructional and performance video by this legendary jazz guitarist. REH's camera crew spent the day with Joe as he visited Musicians Institute for a concert and clinic. Joe Pass on stage at Musicians Institute with Joe Porcaro and Bob Magnusson during the filming of "An Evening with Joe Pass." You'll sit in on the sound check and watch Joe run through some standards in the pre-concert rehearsal with bassist Bob Magnusson and drummer Joe Porcaro. Later, host and fellow guitarist Don Mock talks with Joe about his incredible 50 year career. At concert time, Joe walks on stage to an enthusiastic and packed house. The trio performs many jazz classics including "Satin Doll," "All the Things You Are," and "You Don't Know What Love Is." Joe also plays his solo arrangements of "Stella by Starlight" and his own "Solo Piece." In the clinic portion of the evening Joe discusses and demonstrates his renown style. Answering questions from the audience, Joe talks about chord-melody and "playing what you hear." The booklet includes transcriptions form the concert and examples in music notation and tablature. Don't miss the chance to spend an evening and get to know this jazz guitar giant and very special man. 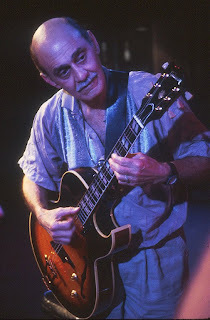 In his incredible 50 year career, Joe Pass was one of the most influential and respected jazz guitarist in the world. He was known equally for his incredible single line improvising as well as brilliant chordal playing. The Grammy winning guitarist recorded numerous solo albums and performed with many legendary artists including Oscar Peterson, Ella Fitzgerald, Dizzy Gillespie, Duke Ellington and Count Basie. REH and Warner Bros. are very proud to have had the opportunity to produce two inspiring and informative videos documenting for all time Joe's approach to the instrument he loved.